The New York Islanders were at the center of a whirlwind offseason, which saw them part ways with longtime captain and former first-overall pick John Tavares, who signed a monster contract in his hometown of Toronto. With the loss of their best player, and a complete front office overhaul that brought in a new General Manager in Lou Lamoriello and a new Head Coach in 2018 Stanley Cup Champion Barry Trotz, the Isles have shaken up their team top-to-bottom. A position that has also seen some changes is goaltender, which, believe it or not, is actually poised to see an improvement in the 2018-19 NHL season. Here’s a look at the goalie pool in Brooklyn. 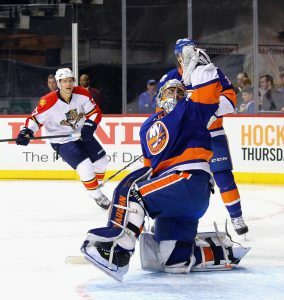 Returning to the crease for the New York Islanders is Thomas Greiss, who has been a serviceable backup his whole career, and a dependable interim starter when called upon. The 6’1″, 227 lb. German goaltender saw a massive hiccup in performance last season, appearing in 27 games, going 13-8-2 while putting up a 3.82 GAA and .892 SV%, with a single shutout. Those are the worst numbers of his career, but playing behind an Islanders team that gave up the most shots and scoring chances in the NHL, he can’t be blamed for all of the team’s shortcomings. His partner, Jaroslav Halak, wasn’t much better anyway. The Islanders decided to move on from Jaro Halak, and needed to find a new goalie to fill his spot. The second goalie expected to dress, as well as start for New York this season, is Robin Lehner, who has spent the last few seasons with the Buffalo Sabres as their starter. Lehner was the captain of the crease for a last-place Sabres squad this past year, and played 53 games posting a 14-26-9 record. He put up a 3.01 GAA, and a modest .908 SV% with 3 shutouts on the year. For being the starting goalie on the worst team in the league, those numbers are actually not as abysmal as one might think, especially the save percentage. The 6’4″, 245 lb. 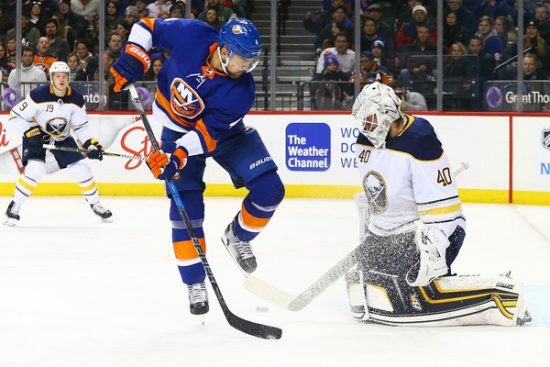 Swede could very well perform better than Halak as a starter for the Isles, and has the potential to be one of the big surprises in the league this year. Although Robin Lehner is slated to start over Thomas Greiss, it’s interesting to note the career stats of both goalies. Although Lehner has spent much of his career as a number one, and Greiss as a backup, they have glaringly similar numbers. In 219 GP with the Ottawa Senators and Buffalo Sabres, Robin Lehner has an all-time record of 72-97-35, a 2.82 GAA, and a .915 SV%. Also, in the two years before last, he had solid save percentages: .920 and .924, respectively, all the while carrying a porous Buffalo defense. On the other hand, Greiss has played 208 games in his career, boasting an all-time record of 98-67-22, with a 2.68 GAA and .912 SV%. Greiss has posted excellent numbers as a backup his entire career, with San Jose, Phoenix, Pittsburgh, and even in New York with the Islanders. He also has a bit of playoff experience, with 12 GP (1 in San Jose, 11 in New York). In the playoffs, Greiss is 5-6, with a 2.48 GAA and .923 SV%. Again, not too shabby, especially considering Lehner’s lack of playoff experience, which totals 2 games with the Senators over 5 years ago. That being said, each goalie brings to the table a similar skill set and a similar sample size of experience, and so I wouldn’t be surprised if they split time until one goalie “won” the position over the other. Either way it goes it’s going to be interesting to see how both goalies fare behind a new defense-savvy Head Coach in Barry Trotz, and a hopefully stronger defensive core. On the AHL front, the Islanders affiliate Bridgeport Sound Tigers have a pair of decent goalies themselves. Hailing from Finland, Christopher Gibson will be the go-to guy in Bridgeport, playing alongside one of a couple other likely choices, namely Linus Soderstrom. Both of these goalies are actually pretty solid, and have proven to excel at the minor-league level. Soderstrom has played overseas for HV71 in the Swedish Hockey League, and has posted good numbers there, as well. If either of Lehner or Greiss were to be sidelined with injuries, Gibson and Soderstrom could serve as dependable, interchangeable backups and minor-league starters. For the first time in a while, Islanders fans should at least be excited about their goaltending situation. Granted, Lou didn’t have much time to go out and acquire the proven starter they’ve so desperately needed for so long, but he did grab what should be an improvement to last year’s situation. Needless to say, all eyes are going to be on the Isles this year as a team, and it’s no different for their goaltenders. 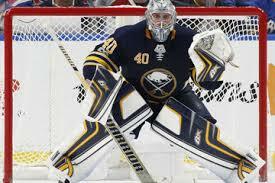 True, Halak and Lehner performed similarly last year, behind a similar defense. However, I still think Lehner is a marginal improvement in goal. Gudlevskis just opted out for the KHL today.